The sexiest way to blog! myTumblr is a gorgeous Tumblr client for Mac OS X and the sexiest way to blog without a browser. The Mac way. Just open myTumblr and start to blog. Drag a photo from your Desktop, iPhoto or Safari – crop, enhance it, or even add annotations and upload and post it with one click. Publishing audio or video files is also a no-brainer with myTumblr. Drag-and-drop, Quick Look them if needed and hit the ‘Publish’ button – and you’re done. Even use your own FTP server – because it’s your content. Two Stellar apps available separately today on ZOT! Powerful and user-friendly Mac Recovery application that provides complete recovery of lost, deleted or corrupted data including documents, music, videos, pictures, e-mails and PDFs. The read-only Data Recovery Mac software is built with highly graphical user-interface that makes it self-explanatory without any prior technical understanding. Compatible with HFS, HFS+, HFSX, HFS Wrapper and FAT file system volumes. Recovers all types of files from your hard drive. Recovers deleted files, complete drive or just the files you want to recover. Recovers images, videos, pictures, music from digital camera media and iPods. scanning, and searching of lost, deleted, or formatted FAT volumes. A 48 hr ZOT…Save BIG Mon and Tues! Contactizer is an amazing all-in-one solution for managing, sharing and organizing your personal and business information. Contactizer Pro makes your contact management experience more efficient, productive and inventive. Contactizer Pro, specifically built for Mac OS X, provides a wealth of powerful PIM features, all through an innovative, elegant and intuitive interface.Localized in English, French, and German. Apple engineers went deep into the code to optimize the new Mac OS X. Objective Decision did the same with Contactizer 3.8. Starting with version 3.8, Contactizer Pro is now fully optimized with Mac OS X 10.6. Manage projects and track their progress. Automatically summarize contact-related information in a single view. Link email messages to your contacts in real time. Collaborative network sharing. No server needed! Tag contacts, tasks, events, communications, projects with multiple category labels. Interconnect all Contactizer items including reciprocal relationships. Mail merge (HTML email template builder included!). Event Manager with meeting organization and more. Manage follow-ups for invitations to events and tasks. Assign Type to tasks and connect follow-up actions (calling by phone, sending a fax, sending email…). Synchronize with iSync and iPhone (and make information available on other devices!). Organize any of your information using smart groups. Built-in Google Maps search service for contact addresses location. Incoming call notifications and dialing through Bluetooth phones. General user interface has been modernised. Low levels have been optimized for the upcoming Contactizer iPhone app. Contactizer Pro is, in many ways, an impressive information manager. The notion of the contact as hub to the information attached to it is an attractive organizational idea – one that you might take to. For the complete review visit Macworld US. The growing appeal of Macs in small businesses has been matched by an explosion of networkable task and contact managers. Despite some rough edges, this new version of Objective Decision’s Contactizer Pro more than holds its own ina competitive market. For the complete review visit Macuser UK. Contactizer is an universal binary application so it will work natively on both PPC and Intel based Macs running Mac OS X version 10.5.4 or 10.6! Unlock the power of your website’s top rankings with the only world-standard SEO software. SEO PowerSuite is the complete pack of four SEO tools. On June 26-27th at MacZOT you can order any of the four tools separately for $49.95 each (50% off): Rank Tracker, WebSite Auditor, SEO SpyGlass, LinkAssistant. Or get the full pack for only $149 (63% off)! SEO PowerSuite is the right toolkit to quickly get #1 Google rankings and transform your website’s sales. There’s a definite science and a definite art to making websites rank #1, which is SEO, or search engine optimization. Do it right, and your business gets found by thousands of new people daily -and secures you new levels of online profits and success. Briefly, it works like this. Most people who search the Web for products or services will go to Google or other search engines and type in their search terms, or keywords. Sites that appear in top results for these keywords are getting the greatest streams of visitors looking exactly for what they offer (that’s why these crowds of people are most likely to pay). Sounds simple? Yeah, knowing exactly what to do makes it easy. And doing that fast makes your website staggeringly cost-effective! So here’s the deal. If you want to quickly, easily, and inexpensively drive your website to Google’s first page and attract thousands of unique visitors, SEO PowerSuite alone is all you need. SEO PowerSuite is made up of four software tools in one pack that, when put together, guarantee you leadership in search engines and new streams of visitors. You can check out all tools one by one, and you can decide to invest in just one or two out of four for the good start. Just click the link below the box to order any of the tools separately. Or get the full SEO PowerSuite, take advantage of this complete site promotion toolkit and save $250!. You’ve gotta rush. Users who’ve been among the first wave to start using this SEO software are now making serious big bucks. Do you want to join this group of folks using the software that is the de facto standard of SEO? If you think making money online is something you, too, need to get into, then don’t miss out on this chance to start right now. Today’s ZOT price is a bargain you simply can’t miss. A massive 250 dollars off — pretty sweet offer, yeah? - Professional support from our Customer Service. We’re always there to answer any SEO-related question you might have — within 24 hours max. Invest in SEO PowerSuite today and start using it immediately! I am in the business of selling solid stone bathtubs and designer bathroom vessel sinks. Bathroom sinks is a very competitive field especially in the current economic climate. I own all your tools and have been using them for the last few months with great results. My website is coming up on the first page of search engine results for some of my targeted keywords phrases which is showing results with increased traffic and inquiries. I run a management consultancy firm in the UK specialized in helping professional service firms (lawyers, accountants, consultants) attract new clients and improve the way they sell. I used SEO PowerSuite software as a core component of my SEO/SEM strategy. Over a few months I was able to gain a large number of highly valuable backlinks, and now my site is ranked #1 in Google UK (and google.com) for a dozen or so target niche keyword phrases — in addition to getting onto page 1 for highly competitive keywords like "business consultants". * Mac OS X 10.3 Panther with Java 1.5 or higher installed, Mac OS X 10.4 Tiger, Mac OS X 10.5 Leopard or Mac OS X 10.6 Snow Leopard; Mac OS X 10.6 recommended. * Any PowerPC G3, G4, or G5 or Intel processor; 1 GHz G3, dual 800 MHz G4, any G5 or any Intel recommended. * 1024 megabytes (MB) of RAM or higher recommended (512 MB minimum supported; may limit performance). * 50 megabytes (MB) of available hard disk space. * A 1024 x 768 built-in display or a display connected to an Apple-supplied video card supported by your computer. * 56 Kbps dial-up connection minimum required; broadband Internet connection recommended. * Product enhancements covered by the Live! Plan are offered free for 6 months since the date of purchase. When this period expires, these search engine related updates are offered on a paid basis. Bug fixes and feature improvements are provided free of charge for life. The Mac way to track your cashflow! Cashculator is not yet another personal finance application! There are dozens of Mac applications in “Personal Finance” category. Most of these applications are very similar – they are complex, costly and focus on past performance by logging and tracking transactions that occurred on your accounts. Unlike most personal finance applications, Cashculator is very easy to use. Cashculator is the simplest way to manage your finances. Like a spreadsheet, Cashculator is very visual and straightforward. Built specifically for personal finance, Cashculator improves upon a spreadsheet by supporting budgeting, easy “what-if” scenarios comparisons and more. • It allows you to live in the future, not the past, by forecasting your future financial situation. • It allows you to make better decisions regarding your personal finance or your small business. • It allows you to manage your finance using a clear, simple and intuitive interface, following Mac tradition. • Cash flow prediction: do you have a surplus cashflow or are you accumulating debt? Unlock the power of your website’s top rankings with the only world-standard SEO software. SEO PowerSuite is the right toolkit to quickly get #1 Google rankings and transform your website’s sales. ***This weekend macZOT will also be offering a great deal on the individual LinkAssistant SEO software products that are bundled in the PowerSuite Professional. If you don’t need all four SEO apps, get them individually this weekend on ZOT at a great price! Inspired by Jef Raskin, our zoomable user interface shows you all the stuff on your computer on a single surface. Using zoom and pan to view, arrange and open documents feels so right. In minutes you’ll appreciate the simplicity and intelligence of our answer to the traditional desktop. Take a spin and see for yourself. System Requirements: Mac OSX 10.6.3 or later. clean up your files. HoudahSpot 3 will add a full set of file tagging features. HoudahSpot 3 adds the ability to tag files. Tags are non-hierarchical keywords assigned to files. They serve a similar purpose than folders. The crucial difference being that a file may be assigned several tags and be located by any of them. HoudahSpot’s tagging feature is based upon the OpenMeta technology. It is thus compatible with a growing number of third party tagging applications. The HoudahSpot Tray is where file tagging happens. The Tray is available from any application. It hides at the edge of the main screen and is activated by moving the mouse to the edge of the screen while holding the optional modifier keys. The HoudahSpot Tray lists your favorite tags as well as tags recently used by HoudahSpot or another OpenMeta tagging solution. Drag a file to a tag to assign it that tag. Drag a file to the file well to be presented with a window to enter any number of tags. Select tags and double-click to start a search. Hold down the option key while double-clicking to match any of the selected tags. HoudahSpot 3.0 will be the first paid upgrade to HoudahSpot. Customers who registered HoudahSpot 2 on or after January 1, 2010 are eligible for a free upgrade. Buy HoudahSpot from MacZOT. 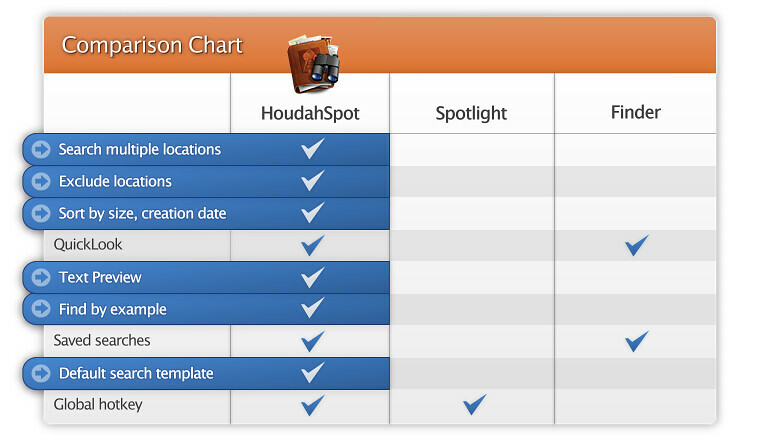 Start using HoudahSpot 2.7 today. Upgrade for free when HoudahSpot 3.0 is released. Moreover you will get immediate access to the latest beta version! HoudahSpot 2.7 & 3.0 require Mac OS X 10.5 Leopard with Spotlight enabled. It is fully compatible with Mac OS X 10.6 Snow Leopard. HoudahSpot earned much praise from its users and the press. This includes a glowing 4-mice review in Macworld. HoudahSpot has been featured as ‘Pick of the week’ on MacOSXHints.com and earned a recommendation on the MacBreak Weekly podcast. Visit houdah.com for more info. Why did you create this app? or What need were you trying to satisfy? HoudahSpot allows you to narrow in on files. Start with the simplest criteria: name, text content, …. Then add on criteria until the result list meets your needs. What’s the most unique, useful feature of your product? Definitely: Find by example. Drop a file on a criterion row for it to update to match that file. I.e. drag an Excel file on the kind criterion to narrow your search to Excel files only. What is most interesting to you about developing SW for the Mac platform. Developing for the Mac is both challenging and very satisfying. Mac users expect things to just work and look good while doing so. One needs to live up to that standard. Once you get it right, your application develops a dynamic of its own. By pairing it up with other applications, your customers start finding endless new uses you did not even think of. HoudahSpot + spreadsheet = command line? Sure! Quoting the HoudahSpot tag line: find files you didn’t know you had. What are some interesting experiences you’ve had creating new versions of your software when OS is upgraded? Apple does a terrific job at moving the platform forward. With each update we have less work to do to achieve the same results. This frees developer time to move forward and explore new features. With Leopard the jump was so big, that I rewrote HoudahSpot 2.0 from scratch. And I got way further with less code. What’s your favorite Mac app out there from another developer? Why? That would be LaunchBar by Objective Development. Application launchers are a must-have addition to any Mac. LaunchBar excels at that task. Probably even more important for me is to have a clipboard manager. LaunchBar recently gained that feature. And excels at it! You can record all your screen activity to demonstrate it in the future; for example, you could do virtual courses, record your game play to show your skills to your friends. With the layered screenshot feature you can make a shot of all windows on screen at one time and then rearrange windows as you like, e.g. change the order or position of windows, hide unnecessary window, etc. There are several options for saving this image: just drag the selected layer to preferred location or save the whole composited image. Also you can save all the layers as separate images. It is amazing and magically! To spruce up your screenshots before publication, use Picturesque (Yes, we really love this cool App). Just drag an image from the CaptureIt! history right to the Picturesque window, adjust effects, and then drag the image out of Picturesque. It is a very easy to use yet powerful tool. CaptureIt! for Mac is available as shareware version. You can use the shareware version for free during a 15-day trial period. The shareware version has a watermark (with colors fading) that will be removed after buying a license. Try CaptureIt! now to discover its features. Enjoy the low price. Pictures and video animations in a just a few clicks! PulpMotion’s got a full menu of visual themes that incorporate your media into clever animations that will wow your friends and family, impress your clients and colleagues. You can even create your own fake newscast like Jon Stewart or Stephen Colbert! PulpMotion helps you tell stories with style. Simply drag and drop your preferred photos or movies, then add your own music, apply a visual theme from the PulpMotion slideshow themes menu and you’re done! More than 40 gorgeous themes let you present your data in innovative ways. New themes are added regularily. Custom themes can be created for your special needs. Clear user interface lets you create stunning compositions in seconds. No movie editing knowledge required. All your creations can be done by “drag & drop”. Hierarchical layout lets you access the relevant sections. Pause the composition at any time to watch the embedded video play. When paused, the soundtrack of the current video can be automatically activated. Choose whether video soundtracks should be played during presentation or export. Choose whether the video media should be played for the full length. Adjust automatically the compositions parameters so that the animation duration matches the soundtrack duration. Keyboard based navigation inside a composition; Skip Backward and Forward to reach the desired media. FullScreen zoom effect lets you bring the current media to full screen and display additional information while the composition is in pause. It’s nice to share and it’s easy, too! Internet connection required for registration. Requires Mac OS 10.5 or above. Fully compatible with Snow Leopard (Mac OS 10.6). For plenty more information (and a screencast) about PulpMotion, please visit PulpMotion.com. TuneUp is the #1 selling plug-in for iTunes that offers must-have music management and music discovery tools for any music fan. TuneUp is now available for PowerPC! TuneUp quickly and easily fixes two of the biggest problems with the typical music library: tracks with inaccurate song information (“Track 01”, “Unknown Artist”, “The Beatles” vs. “Beatles”) and song that are missing album cover art. TuneUp “listens” to your music in order to identify it, which means it won’t matter how inaccurate your library is to begin with. Get the most out of the music you love with upcoming, personalized concert alerts, based off of the artists in your iTunes music library. TuneUp will also display the best music content on the web contextualized around what’s playing in iTunes including, music videos from YouTube, artist bios from Wikipedia, merch from eBay, and much, much more. TuneUp Tour Video from TuneUp Media. This promotion only includes the Gold version (rather than the Annual). For more information about TuneUp, visit our homepage. The Mac Sale! – Ends June 21st. Click “Buy!” on The Mac Sale home page and insert the code when you get to the shopping cart page.